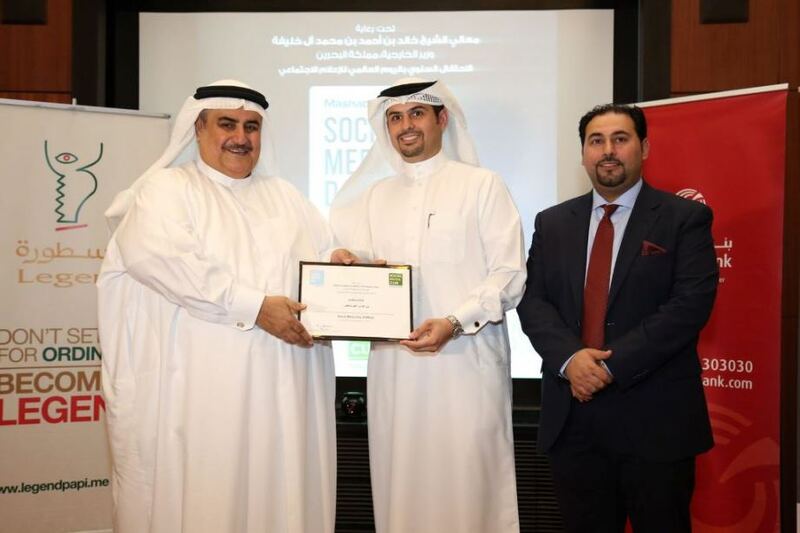 Bahrain, Bin Hindi Informatics W.L.L., the authorized distributor of Samsung mobile phones & IT products in the Kingdom of Bahrain, was recently recognized at a Social Media Club Bahrain awards ceremony for its pioneering contributions to social media. The event’s patron, His Excellency the Minister of Foreign Affairs Shaikh Khalid bin Ahmed Al Khalifa, presented an award to A. A. Bin Hindi’s Director & Deputy CEO Mr. A. Aziz Abdulla bin Hindi on the occasion of Social Media Day recently held at Al-Areen Palace. A. Aziz commented on Bin Hindi’s social media strategy as it is part of a larger effort to engage with all their customers, and keep them informed of new products and services. From the left; HE. Shaikh Khalid bin Ahmed Al Khalifa. Mr. A. Aziz Bin Hindi and Mr. Ali Sabkar, Social Media Club President.